COLUMBUS, Ohio – New research is detailing how environmental stressors, including heavy metals, brought on by human activity are harming coastal green sea turtle populations – work that researchers hope will inform conservation efforts going forward. Large populations live, feed and nest on Australia’s Great Barrier Reef, favoring the bays and protected shores near the coast and around islands. The Rivers to Reef to Turtles project, which ran from 2014 to 2017, examined health of green turtles at two northern Queensland bays – Cleveland and Upstart – known to be impacted by urban and agricultural human activities and at a third remote “pristine” area, the Howick Group of islands. Following up on a high number of turtle deaths in 2012 and 2013 that conservationists were attributing to a “whole kit and caboodle of reasons” including runoff from agriculture, industrial toxins and climate change, the team conducted physical exams and tested the turtles’ blood over time, looking for signs of contaminants and illness, Flint said. They also counted barnacles on the turtles. Flint’s previous work has shown that high barnacle counts on turtles’ undersides correspond to poor health. The theory behind that? When healthy and feeding normally, a turtle’s trips to the sea floor for seagrass meals effectively scrape away barnacles. When the green turtles aren’t eating well, the barnacles build up. One in five of the juveniles examined at Cleveland Bay had high barnacle levels (16 or more) and one in 10 of the young turtles at Upstart Bay had excessive barnacle growth. This level of barnacle growth was not seen in any of the turtles at the “pristine” control site. By the end of the study, the researchers saw some evidence that the population in Cleveland Bay was returning to normal, but the problem still remains for turtles in Upstart Bay. This multidisciplinary approach is the first effort to look with this depth at this population of turtles and the potential links between environmental toxins and their well-being, Flint said. The researchers suspect that the unhealthy measures seen in the turtles that live in areas affected by urbanization, farming and industry are connected to contaminants in their ecosystem. In particular, the study team found evidence of heavy metals, primarily cobalt, in the turtles’ blood. Green turtles migrate long distances between feeding grounds and from the beaches on which they hatched. The reptiles are threatened by overharvesting of their eggs, hunting of adults, being caught in fishing gear and loss of nesting beach sites, according to the WWF. The green turtle is the only “vegetarian” sea turtle, eating mostly seagrass and algae, which relates to its ecological importance. When green turtles graze on seagrass beds, that vegetation remains productive – something the WWF compares to mowing the lawn. The turtles also recycle nutrients they digest, making them available to other animals and plants, which ultimately is important for the survival of invertebrates and fish, some of which people eat. 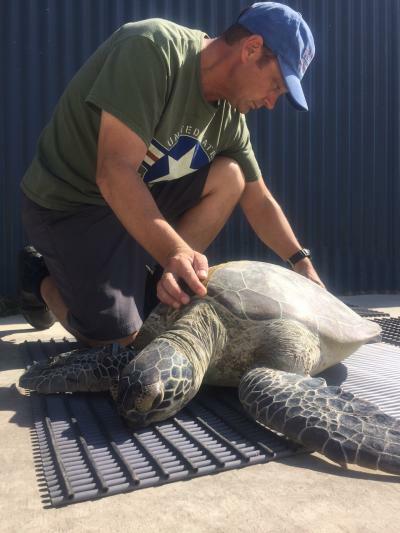 The monitoring of sea turtle health also is important because with their long lifespans and tendency to stay in one place, they can potentially serve as proxies for the broader environment, Flint said. The trouble is, their physical responses to environmental assaults and disease are slow-moving, complicating conservationists’ ability to draw connections between the environment and sickness and death. This research gives conservationists and marine biologists a baseline understanding of sea turtle health and response to environmental stressors, he said, which will better enable them to assess turtle health after an insult and over time. It will also provide tools to help decision makers develop environmental mitigation strategies, Flint said. Other researchers who worked on the study were Ian Bell of the Queensland Department of Environment and Heritage Protection, Anne-Fleur Brand of Utrecht University and the University of Queensland and Christine Madden Hof of the WWF.